British people should still be able to travel freely and vote in EU elections after Brexit, according to Chief EU Negotiator Guy Verhofstadt. The Belgian politician, who is in charge of working with the UK to secure a deal, believes individuals should be able to opt-in to keep certain rights. Speaking to BBC Radio 4’s Today Programme, he also claims to have received “hundreds and thousands” of emotional letters from Brits concerned about “losing part of their identity”, adding they felt no one was defending them. Currently UK citizens have the right to live, work and travel freely throughout Europe. However, after voting to leave the European Union these rights could disappear, as the Prime Minister tries to negotiate a new relationship. Plans for individuals to pay a small fee to ‘opt-in’ to EU membership were first floated by Charles Goerens, a Liberal MEP from Luxembourg. The idea has since gained traction, with Mr Verhofstadt earlier saying he would make sure the idea of ‘associate membership’ was on the table. The European politician is especially worried about having a ‘hard border’ between Northern Ireland and the Republic of Ireland. However, while Mr Verhofstadt said it was important to look for a “new partnership” between the UK and EU, he stressed the relationship could not remain exactly the same. One of the main battlegrounds surrounding the UK’s exit from the European Union has been around the right to live and work in other countries. There are more than three million EU nationals living in the UK, as well as more than a million British people living in other EU countries, most of them in Spain. So far, the Government has yet to agree to safeguard their future in Britain, saying it can’t do this without similar assurances for UK citizens living abroad. However, the House of Lords has tried to amend the Brexit Bill – the law which will officially mark us leaving the EU – in order to guarantee the rights of EU nationals. Guy Verhofstadt Picture: Claude Truong-Ngoc / Wikimedia Commons. UK Passport Picture: Christopher Elison / Flickr. 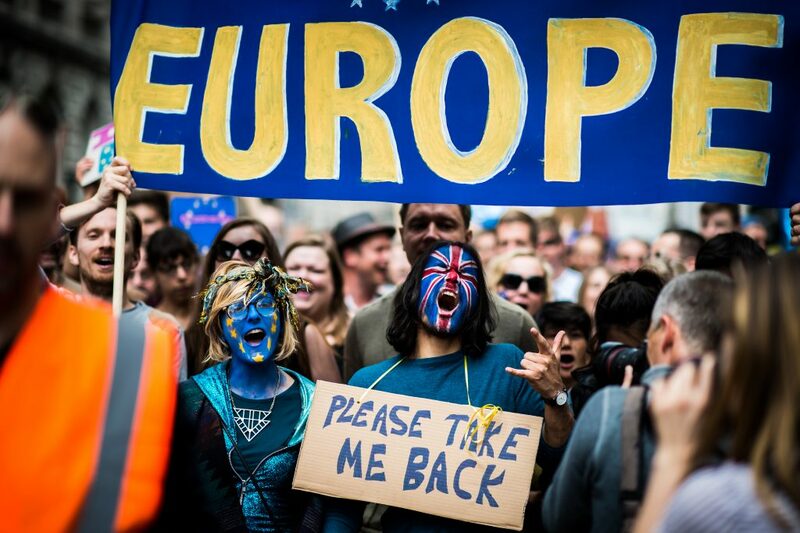 Brexit Protest Picture: Garon S / Flickr.